When you consider all the new features and enhancements Adobe piled into the CS4 release of After Effects, its flagship visual effects and motion graphics software, it’s apparent that the company was very concerned about this sector of the market. This major upgrade to After Effects lets you more easily search and navigate your project, import 3-D layers from Photoshop Extended ( ), fine-tune your 3-D composites with separate X-, Y-, and Z-position keyframes, create new effects like Cartoon and Turbulent Noise, and export complete projects to open and edit in Flash CS4 Professional. In addition, a powerful new 2.5-D planar motion tracker is also shipping with After Effects to help you track hard-to-manage shots. Photoshop 3D layers can now be imported into After Effects CS4 and animated along with other 3D layers. Much-needed production features, such as keyword-searchable timelines and projects and nested composition navigation that shows hierarchy in a graphical flowchart format, have been added to this new version. In keeping with the overall application integration touted in the other CS4 updates, you can now export rich media from After Effects to Flash CS4 Professional while still retaining layer and keyframe data for further editing. This means a project you create in After Effects CS4 will transfer all the layer and timeline data over to Flash for further programming and video production for online distribution. This new version also improves asset management and copyright tracking by letting you add and maintain XMP metadata throughout your After Effects projects from start to final render. Mobile-device authoring has been integrated into the workflow, complete with multi-device previews for most popular phones and PDAs. For the first time, you can import 3-D layers created in Adobe Photoshop Extended or apply effects like distortion or other filters over time. 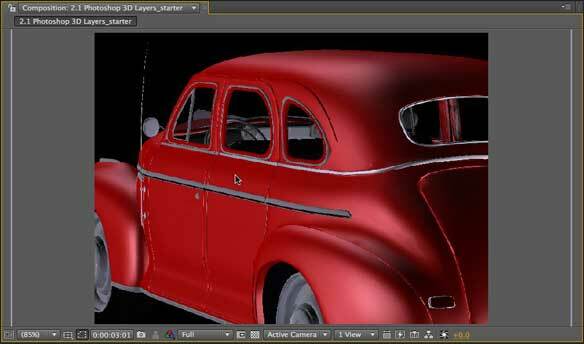 The 3-D objects are imported as Photoshop layers but they retain their full volumetric space—they’re not just 2-D snapshots from a predetermined angle. Using the new Unified Camera tool, you can animate cameras around these objects, and apply lights, effects, and other 3-D layers. However, the lights will only illuminate the object as they would any other 3-D plane: they don’t have true reflectivity or specular highlights, as those are applied in Photoshop CS4 prior to importing to After Effects. One thing I have noticed however, is that After Effects’ Motion Blur does not work on these layers the same way it does with other 3-D layers, but since 3-D layers are still, after all, layers, effects like distortion or other filters can be applied to them over time. After Effects CS4’s new QuickSearch box lets you search for either keyword or file type on both the Project and Timeline panels. Even deeply nested files are now visible in the Project panel. Plus, the Timeline panel’s QuickSearch reveals layer properties such as rotation and position at a glance. Instead of having to select each layer in the Timeline and use keystrokes to reveal specific transform or effects properties, such as Position, you can now enter the word position in the QuickSearch box and all layers in that composition will reveal only their Position properties. If you’re working in the 16:9 aspect ratio, there’s a new 4:3 center cut safe area visible (with the Title/Action Safe overlays) to help you focus on the center for broadcast media production. A new Auto Resolution/Down Sample Factor menu item on the Composition panel redraws only visible pixels when you preview at any scale to save time and video card memory. You can now adjust RAM, multiprocessor, and OpenGL memory to take advantage of today’s powerful, multicore Macs and more robust video cards. In addition, all of these enhanced interface features make working on a Wacom Cintiq tablet much easier, without the need for continual keyboard commands or pull-down menus for repeated tasks, which further speeds up the production process by keeping your focus on your project. After Effects CS4 boasts tighter integration with Flash CS4. You can now export projects and compositions as layered projects (XFL files) that you can then import into Flash CS4 Professional and edit with all their properties. FLV, PNG, and JPG source footage files need no further transcoding, and animated transformations such as scale, position, and rotation are preserved in the layers and can be further edited in Flash. Other media files and layers with attached effects are converted to Flash-compatible file types. You can use scripting to embed the results of After Effects’ motion tracking, expressions, and keyframe assistants, into media you can then access in Flash. I’ll take a Mocha with that! Imagineer Systems’ Mocha for After Effects is a stand-alone application that now ships with After Effects CS4. This powerful 2.5-D planar motion tracker works better than point-based trackers on problem footage—for example footage with objects moving out of frame or poor lighting conditions that show little detail, or excessive noise. The program’s tracking data is imported back into After Effects and then applied to Corner Pin position data for accurate tracking. There is a bit of a learning curve for Mocha, and there are times when the built-in tracking and stabilizing features in After Effects are actually more appropriate to use (not to mention easier), but what Mocha does do to complex tracking and stabilization of footage is amazing. You can copy and paste tracking data from the clipboard or save that tracking data from Mocha to a text file for later retrieval for tracking or applying the Corner Pin effects in After Effects. However, Mocha still seems like almost an after-thought they put in the box, since there isn’t any real integration with After Effects and the instructions that come with it leave out some very important file preparation and set-up details you must figure out before getting a successful track. That’s hardly a reason to think anything very negative about it other than streamlining the workflow, but I’m hoping that if Adobe continues this relationship with Imagineer Systems, this improved tracking system will appear as a fully integrated feature in future releases. Imagineer Systems’ Mocha for After Effects, a stand-alone application that now ships with After Effects CS4, is a powerful 2.5-D planar motion tracker that works better than point-based trackers on problem footage. This simulates the effect of a cel painted cartoon animation to your live action video footage or animated compositions. What at first appears to be similar to a “watercolor” filter, the Cartoon effect actually smoothes and enhances the edge details and soft gradients while ignoring minute details, leaving a smoother result. I found that changing a composition’s playback speed to 12 or 15 fps gives a more realistic and stylized cartoon effect and looks less like a filter that’s been applied to your footage. Somewhat similar to a “Smart Blur” effect, the Bilateral Blur uses high contrast and edge detection to preserve sharp edge details while further softening smooth surfaces with less contrast than what might be in the original footage. The effect is a bit eerie though in that it seems to just “know” what parts of your footage are in motion or which details are important. This effect simulates clouds, fog, smoke, fire, light rays, plasma, and more. Using fractal-derived noise, it can create some stunning natural effects beyond the more common particle effects. This effect alone can replace several standard particle effects you may already be using, and will allow you to create your own stock background elements library. 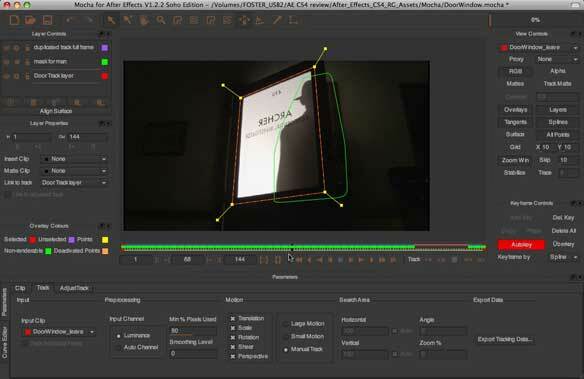 Adobe has improved the workflow between After Effects CS4 and Adobe Device Central CS4. Because it can be frustrating and time consuming to produce projects over and over again for each of the wide variety of phones, PDAs, and other mobile devices out there, this new workflow allows you to preview the devices you select side-by-side and make adjustments in your composition to accommodate each device’s size and aspect ratio. This feature will definitely expedite this workflow for the increasing demand of today’s rich media mobile device content development. There is now an improved workflow for asset management and tracking, copyright and royalty management, and project management from source materials to the final product. XMP metadata is applied to your content and remains intact all the way through the production process so you can trace elements while you’re building your composition, and even after you’ve rendered it. Song or image file copyrights, for example, can pass through the process and incorporate into the final composed video or Flash project. You can even preserve Marker metadata on a timeline from a project such that the rendered movie retains this data when imported back into After Effects CS4. After Effects CS4 represents one of the most significant and useful upgrades in recent history. The new version’s interface now integrates more seamlessly than ever into the rest of the CS4 suite. As the demand of most content creators and motion graphics producers increases significantly, it’s good to see that Adobe is still providing tools to help make the workflow easier and more intuitive, allowing the artist’s creativity to come to the forefront.